The work that needed to be carried out on these two rides has now been finished. 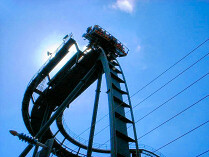 Oblivion's new lift chain has been fitted, and the ride has run. The new chain is said to be extremely quiet, which might appease Mr and Mrs Roper. Rita's hydraulic drum has not been replaced after all. Earlier this month, the new drum that was due to replace the current one, was damaged whilst still under construction. This damage was so severe that it meant the new drum could not be used, and there wasn't enough time to start from scratch, so the decision was taken to repair the current drum. It will now be used throughout 2006, with a (different) new drum coming in during the next closed season. The repair work to the current drum has now been completed, and the park are hoping to have Rita testing by March 10th, one week before the park opens.